Important archaeological remains have been uncovered on Ministry of Defence land earmarked for 227 new Army family homes in Bulford, Wiltshire. The excavation, by Wessex Archaeology working for the Defence Infrastructure Organisation and its consultants WYG, revealed Neolithic pits, prehistoric ring ditches, an Anglo-Saxon cemetery and 20th-century military features. The development is part of plans by the MOD, under its Army Basing Programme, to accommodate the 4000 service personnel plus their families who will be returning from Germany to bases on and around Salisbury Plain. The Anglo-Saxon cemetery contained about 150 burials, one of which has been radiocarbon dated to between AD 660 and 780. This falls in the mid-Saxon period in England. 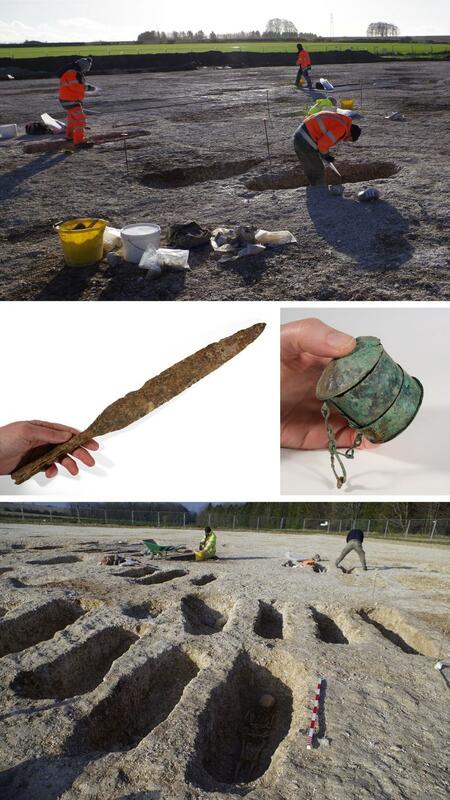 Grave goods included spears, knives, jewellery, bone combs and other personal items. A second phase of excavation will examine the two prehistoric monuments close to where the cemetery was established. These may be Bronze Age round barrows with earlier, possibly Neolithic origins. Nearby Neolithic pits contained pottery, animal bones, tools, and other objects of stone, chalk and flint. The 20th-century military features included World War 1 training trenches and World War 2 anti-tank firing ranges. Two loose clusters of Late Neolithic (c. 2850–2200 BC) pits have been recorded on the site, containing a remarkable series of special deposits. So far some ten pits have been excavated, but it is known from the earlier evaluation trenching that similar pits exist more widely across the site. While Neolithic pits are a relatively common feature of the prehistoric landscape, the exact purpose of these pits is uncertain, although it is clear for the special nature of many of the objects found in them, and the way that some of these had been carefully placed, that they were not used for the disposal of waste. The selected objects probably had symbolic significance, and their formalised ‘burial’ is likely to have had a ritual or religious purpose. The digging of the pits themselves, which were all of similar size – about 1 metre in diameter and up to 0.6 metres deep – was also probably an important part of this ritual activity. 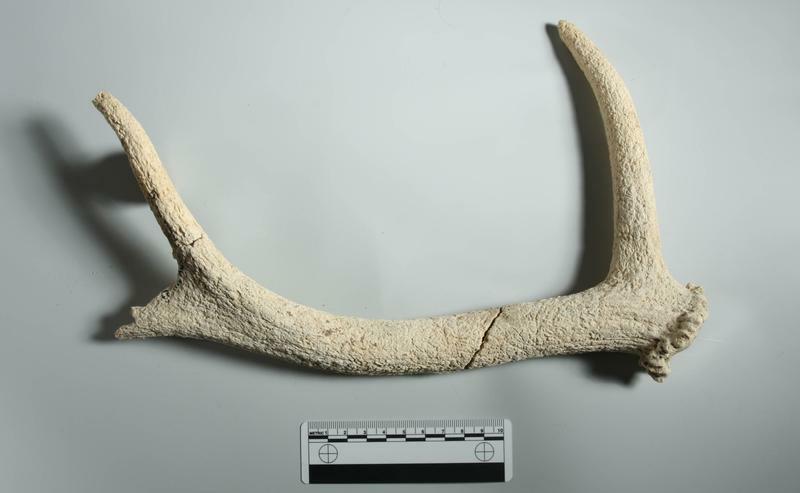 As soon as they were dug, however, they were apparently refilled sequentially, probably with material containing organic components followed by large more durable ‘special’ objects of stone, antler and bone. These objects include a Cornish Greenstone axe, miniature and polished flint axes and a very finely made and rare discoidal flint knife. The other flintwork recovered was different in character from typical domestic or industrial assemblages, containing few scrapers and little flint knapping waste. One pit contained a large amount of flint core material – an element often absent from flint knapping assemblages. 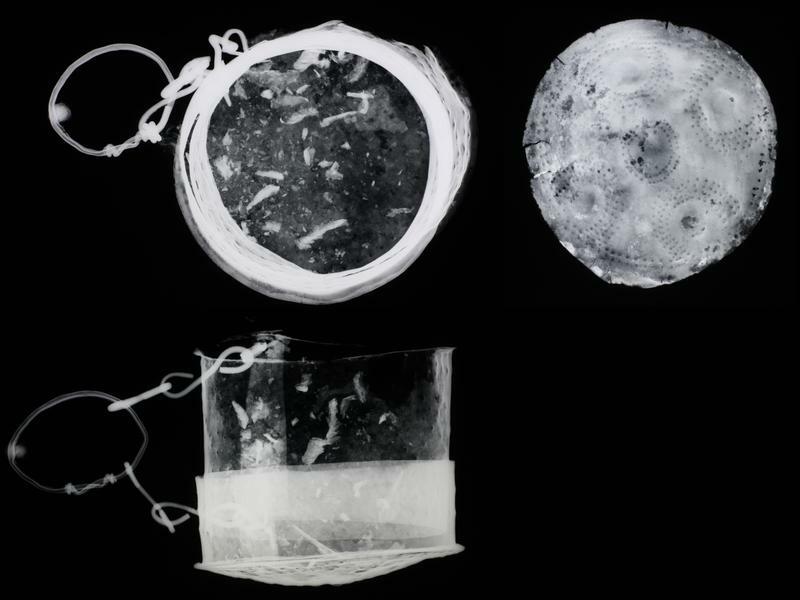 Two notable stone objects were made of chalk – a small spherical ‘ball’ and a large concave ‘bowl’, both of which still showed the scoring marks by which they had been carved and shaped. Animal bones deposited in the pits included those of cattle and pig, and red deer and roe deer; one pit contained the horn of an aurochs (a species of wild cattle). Also from the pits was a form of decorated Late Neolithic pottery known as Grooved Ware. The sherds were in the Woodlands style – which is distinct from the Durrington Walls style found at the massive Late Neolithic henge just over a mile to the west. This group of well-preserved pits, therefore, provides a very important opportunity to examine a distinctive assemblage of Woodlands-style associated finds. The dominant features on the site were two adjacent ring ditches. 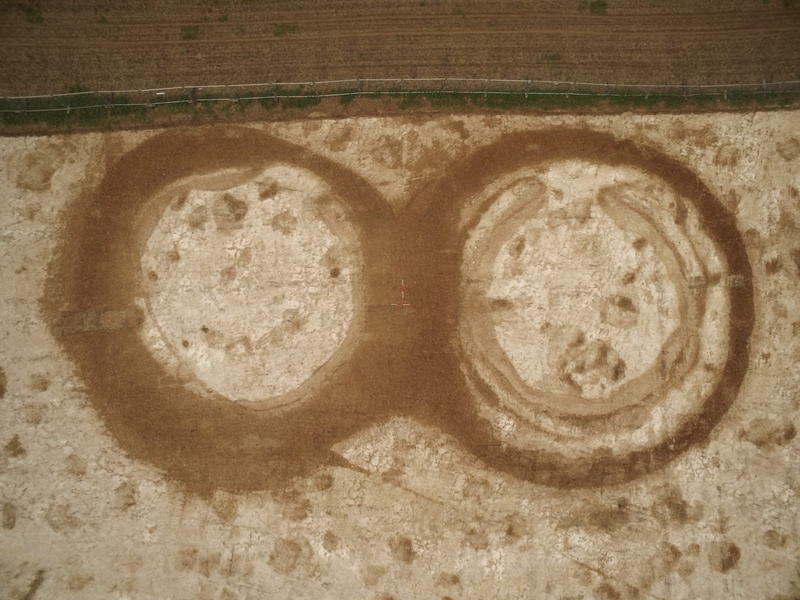 At first glance they appeared to be the ditches of two adjoined Early Bronze Age round barrows, but closer inspection of aerial drone imagery suggests that they had a more complex history with earlier, Neolithic, origins. Evaluation showed that both ring-ditches began as segmented hengiform enclosures with single entrances on the northern side. Deposits from the ditches included Late Neolithic Grooved Ware of Durrington Walls type, struck flint, and animal bone (including the skull from a large dog or wolf). Once the original segmented ditches had filled, both were surrounded by continuous barrow ditches of probable Early Bronze Age date. Both had evidence of a central mound, while the western ring-ditch also appeared to have an external bank. The ring-ditches have been preserved and have been protected as a Scheduled Ancient Monument. The Anglo-Saxon cemetery at Bulford is sited on a ridge overlooking Nine Mile River, close to where it joins the River Avon. The cemetery contained around 150 graves – of women, men and children – including a number of rare, re-used graves which probably point to family connections, and would have served a local community. The cemetery was established close to two prehistoric monuments, such ‘ancient’ earthworks often being the focus for pagan Saxon burials. Although the one grave radiocarbon dated so far, to 660–780 AD, falls in the ‘conversion period’ when the population gradually adopted Christianity as their religion, there were no indications that any of the graves contained Christian burials. Most of them were aligned roughly west to east, which although the norm within the early Christian burial tradition, is not a conclusive indicator of religious affiliation. A significant number of the burials included grave goods. One male grave, aligned north to south, contained a spear with a very long socketed head and, decorative bronze bindings along its shaft. Other graves contained knives, buckles and bone combs. Items of jewellery included a bronze brooch, bronze earrings, amber beads and a cowrie shell probably traded from the Red Sea area. One grave had a Roman coin in it, probably an heirloom, while a small pottery vessel was found in a baby’s grave. One woman was buried with a decorated cylindrical bronze box of a type referred to as a ‘work box’, ‘thread box’ or ‘relic box’; whatever its use, it would have been a valued personal possession. Another was buried with a chatelaine – a set of short linked chains that would have attached to a woman’s belt, used for carrying personal items. Below is a 3D reconstruction of how the workbox would of looked when it was new. The size, location and date of this cemetery make it of considerable research importance. By the end of the Saxon period there was a relatively large settlement in the vicinity, with 39 households recorded at Bulford in the Domesday survey. These graves, therefore, may take us right back to Bulford’s early families. Prehistoric monuments, Saxon graves and military features from WW1 and WW2 have been uncovered during pre-development works on Ministry of Defence land in Bulford, Wiltshire, which is earmarked for 227 new Army family homes.